There’s not a great deal to say about this pattern that hasn’t already been said I feel, but it is finally my turn to see what all the fuss is about with The Agnes top. I picked up the pattern from Sew Crafty recently when they had a 50% sale on patterns. At the moment I am trying not to be tempted by sewing patterns unless they are on sale, so I was delighted to see this, as I hadn’t ever seen any Tilly patterns at reduced price before. Maybe I should have picked up more… Anyhow it is a really great website with lots to tempt you with, so I would recommend that you head over there and take a little peek! I know it’s been said before but this top really is a great wardrobe staple, and it is the perfect close-fitting jersey top to be worn under all those Cleo pinafore dresses that we all have! I chose to make a simple long-sleeved version, but there is also the option to choose cropped or ruched sleeves, and there is a ruched sweetheart neckline version too. Tilly patterns are a dream to sew. Beautiful quality thick paper pattern pieces are just the best to trace from, and the instruction booklet is just gorgeous as it has fabulous photos as well as thorough written instructions. You can’t go wrong! There is a huge amount of helpful information on the Tilly and the Buttons website too, so do check that out if you are a beginner. The skill level requirement for this pattern is described for ‘improvers’. I chose a red and white striped jersey knit for this project (insert your ‘Where’s Wally/Wenda joke here)! I love it. I have a ton of striped fabrics in my stash at the moment so expect to see more very soon! It’s lovely and easy to cut out as there are only four pattern pieces in total. As for the sewing – this is super quick to make too. I guess that it took me about 30 mins to cut out (including tracing my pattern pieces), and maybe about an hour to an hour and a half to sew up. Thumbs up for that! Stripes involve a certain amount of pattern matching of course, but it went pretty well I think. 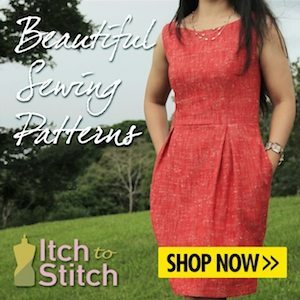 The length of the sleeves and body are nice and long – how I like it, but you can try it on before you hem either of them and shorten them if you prefer. I could not be happier with this top, and I ask myself why it has taken so long for me to give it a go. I have lots more Agnes plans and like many of you will soon have several to choose from in my hand made wardrobe. Previous post: Simplicity 8342 Summer Sewing Challenge Entry. This looks amazing! I love the colour.